The concept of angles builds on most effectively using your ready stance to position yourself between the shooter and the goal. In the one ball, one shooter world that can be a pretty simple concept. Throw in variables like your size, your reaction time, passing options and players in the way, and things get complicated. Complicated doesn’t mean impossible, a keeper just needs to take these things into consideration and put them to use. 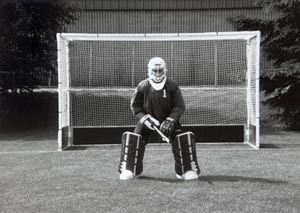 Starting with basics, a standing keeper should be able to cover a yard to either side of his center (at least that’s what we hope a good ready stance will allow). Building on that premise, the keeper covers two yards. If a keeper stands on the goal line in the middle of the goal, that leaves two yards of open goal (the goal being four yards wide). If the keeper steps off the goal line on a line from the middle of the goal towards the shooter, that area outside the two yards the keeper takes up by standing gets smaller. When the shooter is at the middle of the goal, the most goal area is open. As the ball goes to the sides, the scoring area gets smaller if the keeper maintains the distance he is off the goal line. Angles are geometry and the principle builds on the keeper always being on a line from the middle of the goal to where the shot is coming from. Shots can happen from the front stick and the reverse stick. A keeper can’t just line themselves up from the middle of the goal to the player taking the shot, it’s got to be on a line from where the shot is coming from. When first introducing the concept of angles to young keepers, make the concept concrete. You can do it with ropes. Put a ball at a spot in the circle, get a long rope, tie it to the goal posts and pull the middle of the rope to the ball. When the keeper is centered between the rope, he’s on goal. Let the keeper see it from the shooter’s perspective and from behind the goal. Move the ball and shift the keeper. Angles start with being on line and can be an abstract concept for keepers, young and old. Depth is the second part of angles. Going back to variables, how far a keeper plays up on the line of the shot will depend on his strengths and weaknesses in relation to where the ball is in the circle, as well as the keeper’s own size, flexibility and reactions. With a simple shot from the top of the circle, a small keeper is going to have to play further out than a big keeper does to cover the same area. Physical abilities (or limitations) require it. Effectively playing angles means building on your experiences and strengths. To find out what the best distance for a keeper to play off his line is requires patience, discipline and players willing to work with the keeper, especially with beginning and younger players. There is no substitute for experience/practice, but experience has to be structured. It does no good for a keeper to stand in goal for a hundred shots if they’re coming from everywhere and going anywhere. By putting a keeper in a situation where they take 20 balls from the direct top of the circle and gradually adjusting the distance the keeper plays off their line, the keeper can get a sense of where he’s most effective saving the ball and clearing it to a space. It’s important that you not lose the focus on clearing the ball. Too many times the emphasis of angle work becomes lots of shots, some saves, no consequences (i.e. feedback or second shots). Angles are awareness and a keeper needs to know where they are making their most effective plays of the ball. Set up sets of 20 shots from different positions around the circle, one spot at a time. Give feedback, set up clearing targets, put rebounders in the drill, whatever is appropriate for the level and abilities of your keepers. Going back to guidelines, there are no set/carved in stone rules for angles for every keeper. Generally, with a set shot at the top of the circle from the center, the keeper will be the farthest off his line. As the set shot shifts to the sides, he can cover the same goal area with similar results by being closer to goal and not as far off his line. My own experience has been that with a shot from just inside the D in the center, I’m most effective playing three yards off my line. As the ball goes to the sides from the edge of the D, that distance goes down to two yards, then one until the ball goes baseline and I go to my post. A lot of people talk about playing angles as an arc, or an extended arc. I’ve used the analogy of the arc being shaped like the top half of an egg, but that also applies to my individual abilities and limitations. Some keepers can play a round arc, I couldn’t. Angles simplified: an overhead diagram. Each letter represents a shooting position and what a keeper covers simply by being in a ready position on the proper angle. There are philosophies and principles that can be built on and most of them apply as the ball moves around the circle. When a ball is passed to the left or right from the top of the circle, a keeper can’t move to their left or right simply in the line of the ball, they need to move in relation to the ball and the goal. Their movement is not going to be flat, it’s going to be arced, rounding back to the post. This is an especially critical concept for beginners. Repositioning on a small pass, shuffle steps. It’s important that as the keeper moves, he stays square to the ball and the goal as the ball travels. We talked about this in the last tip, The Ready Position. A goalkeeper can most easily make a positive play of the ball if he’s square to the shooter. I like to try to keep things easy. Easy for me is using short, quick, shuffle steps (never crossover steps). By doing this, I stay in my ready position (or reasonably close) as I move. The result is I maintain the ability to make a positive play on a shot while moving. When there are big changes of angle from left to right or right to left, a keeper may have to drop back to center and realign himself when taking on a forward or shot to get on an angle from goal. The OBO goalkeeping video does an excellent job of illustrating this concept. If a keeper goes from one angle to the next on a pass without realigning himself, he’s never in the goal when the shot happens and he ends up going out at where the ball was as opposed to where it’s going, i.e. at goal from the new angle. Repositioning on alarge pass, realign. You can incorporate movement (big and small) in to simple drills that start with a pass to the side and result in a shot. Once again, make sure these drills are structured. If a keeper is off on his angle, stop the drill, show him where he is and make the correction. An important correction is not only showing the keeper where he needs to be, but also how he needs to get there. If you don’t have the players to do this drill with a pass, have the keeper start from a cone at a fixed point and on the coach’s call take a shot from a different angle. As keepers become more proficient, you can add a couple of different angles and call them by number, or allow forwards to make passes within the circle to change the angle. The key is proficiency. If a keeper can’t consistently save and clear a shot with one change of angle, do not expect him to play shots where there are three changes of angle. We’ve talked about the distance a keeper plays off the line with a shot from a set spot. That all changes with a little thing called a pass. A shot from the endline isn’t necessarily dangerous, but a pass to a player at the penalty spot from the endline is. Similarly, an opponent with the ball and a defender on him is not likely to be as dangerous as the opponent’s open teammate. Modern hockey has shown that a keeper can’t just be a goalkeeper, he needs to be a circle defender. Sometimes a keeper can stay back and be set for a shot, other times he might need to step up and intercept a pass, some times he might have to step up to pressure/smother a shot. Blagoevgrad . Angles incorporate all of that. Playing the situation: A keeper angled to play the pass and the shot from the side. Angles build on knowing where you are in the circle. We’ve talked a lot about keepers being a circle defender and not just making plays of the ball on the goal line. There’s not a whole lot of advantage to a keeper coming off his line, if the result is that he’s going to concede a goal on the pass because he doesn’t know where he is. It’s important to know where you are in the goal from landmarks around the field. Use landmarks like the opposite goal, the arcs of the circle, the 25 at the sideline and long hit marks to find your bearings. Too many times a keeper uses a marker like the penalty spot to find center. That’s fine if all your plays are two yards from the goal. As soon as you get farther than seven yards off your line, you have to look back to find where you are. A keeper never wants to look back to find where he is. There are extremes to everything. 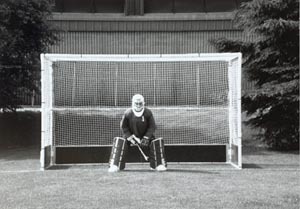 The further out a keeper plays, the more net he or she covers, but at the price of less reaction time to save the shot. 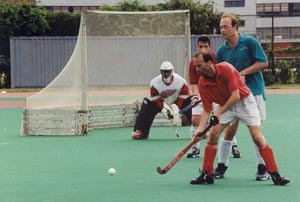 At the same time, the further out a keeper plays, the easier he or she is to pass around. Effectively playing angles means finding a balance between extremes and incorporating your strengths in to your positioning.